Are bounced checks making you crazy or are you tired of wasting your time chasing a bad check writer?Do you write off too many bad checks as part of doing business? We have a service that can help. For a one time low set up fee of $95 we supply our Free Non-Sufficient Funds (NSF) Check Recovery Program. Avoid the pain and embarrassment of having to harass the bad check writer to get your money. Our service converts the bounced check into an electronic transaction and collects it by debiting the customer’s account directly. Because we time the collection transaction we achieve a very high rate of success. 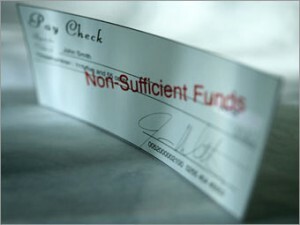 You receive 100% of the face value of the check and we collect the bounced check fee directly from the bad check writer to pay for the service. If the account has been closed and our service cannot collect the funds the check is sent to secondary collections free of charge. If successful the full amount of the check is deposited into your account. Become an EFTS Merchant Services customer and the setup fee for our NSF Collection Service is waived. Click here to download our NFS application or contact us today for more information.